I am at the Kumbh Mela in Ujain India, with about 30 million other pilgrimage makers! It is a totally wild scene here. I am at the program being run by Paramahamsa Nithyananda. The program is about developing the ability to increase intuition and there are some remarkable events showing up. For instance, the other day about 90% of over 2000 participants shared that they had intuitively recognized various objects using their third eye. Nithyananda recommends that we all take Haritaki daily as part of our regime to increase consciousness. 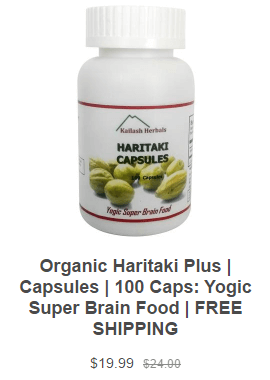 Many people here are also reporting great success with Haritaki. Ian, a professional musician feels that it gives him much more energy. He was developing a sore in his mouth, so asked me for help and took some capsules, crunched on them and reported that he immediately felt some relief, and reported later that the issue was cleared. One of the highlights the time here is seeing the rapid improvement in third eye reading by the adults and children. Each day more and more people show skills. Today a friend, Sylvia from Vancouver, came to me and told me that she was asked to read with her third eye what another person was thinking. She said that she scanned for about 2 minutes and then saw me. She said,” Dheera?” She was correct, the other person, another friend of mine had decided to visualize me. Sylvia was really happy to have that image appear for her and have it confirmed. For myself I too have had some breakthroughs. One day we were asked to identify a color that the team lead was thinking of. As soon as the question was asked I sensed the word blue from my internal intuition. This was correct. The next question about what the team lead was thinking was also correct. Many people here are used to taking Haritaki, they are confirmed long term takers, who feel that the product is helping them a lot. Many of them are able to take it by the spoonful.